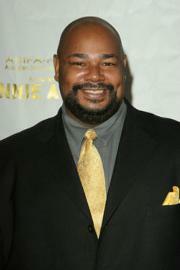 Kevin Michael Richardson (born October 25, 1964) is a popular American actor and voice artist. Richardson has usually portrayed villainous characters due to his deep and powerful voice. His most prominent voice roles include Gantu on Lilo & Stitch, The Joker in The Batman, Shadow King and Bishop in Wolverine & The X-Men, Goro in the Mortal Kombat film, and multiple characters in Family Guy, The Boondocks, American Dad!, Clerks, My Little Pony: Friendship is Magic, Dan Vs., and The PJs. He also portrayed several heroic characters, such as Roadblock in G.I. Joe: Renegades, Bulkhead in Transformers: Prime, Panthro in the 2011 Thundercats series, Kilowog in Green Lantern: The Animated Series, and The Martian Manhunter in Young Justice. As of 2009, he stars on the Family Guy spinoff The Cleveland Show. His live action roles include Rockefeller Butts in the short lived Knights of Prosperity, Darnell McDowell in The Cleaner, the voice of Goro, in the first Mortal Kombat film, and a police officer in Kevin Smith’s Clerks II. Richardson voiced the role of General Aguila, leader of the Stone Generals, in TMNT. He will take the role of The Shredder in Teenage Mutant Ninja Turtles (2012 TV series).